Oppdag gamle funn - enten det er møbler, klær eller noe annet - på denne private 4-timers tur til Les Puces de Saint-Ouen-markedet i Paris, det største loppemarkedet i verden. St Ouen loppemarkedet har 14 forskjellige deler med mer enn 2000 butikker. Din personlige guide er tilgjengelig for å styre deg til de riktige leverandørene og hjelpe deg med å forhandle de beste prisene. Du må bare angi før turen hvilke typer varer du søker etter, og din guide vil skreddersy din handleplan. 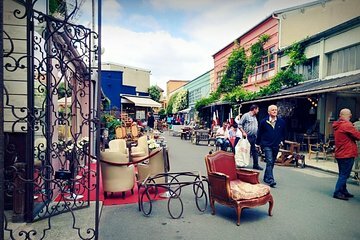 We loved the flea market tour and our guide, Solene, was a wonderful guide. She knew the different areas of the market and with her help we were able to find some fabulous antiques at the right price. She also liaisoned on our behalf with the shipper, which was very helpful. I was sad when the tour ended. I felt like I was saying bye to a good friend! We will definitely repeat this tour on return trips to Paris. WOW! How lucky we we to do this tour. This isn't just a market, this is the most stunning vintage and pre loved market we have ever seen - and we travel all over the world. Solena our guide was so knowledgeble, passionate and experienced. She treated us as the client and we felt like we had made an instant friend. Shopped til we dropped Treasures taken home included LV, Chanel, Kodak vintage camera with original bag, vintage Seiko watches .... Solena asked us what we wanted, took us to the best places, told us who to avoid and bargained for us. Enjoyed her company immensely and if you want to shop Parisian style - this is the one to do! Wonderful, exciting, memorable. Our tour guide Solene, an expert in this market. She introduced us to vendors and helped us with our purchases. An experience we would have never had if we had tried to tackle this on our own. For a true French market experience this is definitely the way to go. Amazing! Solene knows the market inside and out. I never would have been able to navigate it without her. The vendors know her and give her better prices so you will actually save money using her. It's very important to her that you find what you're looking for and she literally won't stop until you find it. She also has a genuine enthusiasm about the market and you can tell that she's having fun as well. I had wanted to go to Saint Ouen for years, but was intimidated by not being proficient in French. Our guide, Solene, was wonderful to work with. She diligently helped me search for specific items. Shopping with her saved an enormous amount of time because she knew where to find the items I was interested in, and she was a delightful person to be with. The vendors know her and greeted her with smiles. We had a truly wonderful time, and I wouldn't hesitate to book any sort of tour with her again.. This excursion with Solene was so much fun! I found everything I was looking for. My new vase, candelabra and mirror are going to be treasured pieced for me to look back on and remember this trip. I highly recommend this tour for all first timers to this flea market because it is an absolute maze! I have been to Paris many times but avoided going to the St. Ouen Flea Market because it seemed to be overwhelming and I didn't know where to begin. After going through the market with a private guide who knew the vendors and her way around the market, I had a great experience and look forward to venturing to the market on my own the next time I am in Paris. Our guide was great haggling prices for us in French and helping us use our time wisely by taking us to the booths that we were interested in. We left the market with our arms filled with treasures. Did a number of tours in Paris. This by far was my most favorite. If I could give more than 5 stars I would. The guide confirmed my pick up time and took me to the most amazing flea market. She was extremely knowledgeable as to which shops to visit...there are a ton of them and the place is a maze. You have to take this tour if you go to Paris!!!! What a great time! My guide was so kind and knowledgeable. I gave her a list of things I liked and she was able to find individual items I loved. So glad I did a tour- I would have gotten lost and not have found the places I wanted to see. You need a guide your first time in the St Ouen flea market. The four hours I spent here flew by. I don't usually shop that long. Also included a coffee break in a delightful restaurant. This was our best day of our entire trip to Paris. Our guide, Solene was lovely, very helpful and knowledgeable about the flea market. She inquired prior to our visit about our interests and made sure we visited the shops that would satisfy our interests. We even went to a quaint café for a drink that was not tourist and gave us a flavor of how the true Parisians spend their days at the flea market. We highly recommend and we will even do this tour on our next visit!